This is the 1970 version of the Ben Cooper Superman costume with its original box. The costume features flame retardant materials and comes with a vinyl cape and plastic “domino” mask. It’s amazing to me that these costumes cost only $2.96 at the time. This version of the costume continued to be sold through the early 1970s until they revised the costume’s material and included a face mask instead of the domino mask. January 9, 2019 in CLOTHING / COSTUMES. May 11, 2018 in TOYS, VEHICLES. 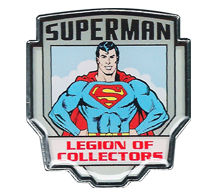 Here is another one of my favorite Superman collectibles that, oddly enough, doesn’t feature Superman anywhere on it. March 23, 2018 in TOYS, VEHICLES. March 16, 2018 in FIGURES / STATUES. March 2, 2018 in GAMES / EDUCATIONAL / SPORTS. February 16, 2018 in ADVERTISEMENTS / PROMOTIONAL.